If factual, this would be an historic event! Si indica la prima domenica d’avento – Il direttore di “Latinitas”, ben venga avremo preghiera comune di lode a Dio. Citta’ del Vaticano, 28 lug. – (Adnkronos) – Il Papa potrebbe celebrare pubblicamente la messa in latino secondo il rito di San Pio V. Un’introduzione ufficiale del rito che, a quanto apprende l’ADNKRONOS da autorevoli fonti vaticane, potrebbe avvenire la prima domenica di Avvento, inizio dell’Anno liturgico. Signs point to the First Sunday of Advent – The Director of “Latinitas”, at last we will have a common prayer of praise to God. OK … Traditionalists, Neo-traditionalists, Conservatives, Neo-conservatives, Restorationists, Neo-restorationists, and all faithful Catholics … time once again to “storm” heaven with our prayers. Remember the Spiritual Bouquet of Rosaries presented to the Holy Father? … Ah, the power of prayer. “Our,” if you persist in your ego. “Father,” if you don’t share like a family. “Hallowed be Thy Name,” if you only believe in earthly things. “Thy Kingdom Come,” if you confuse it with materialism. “They Will be Done,” if you won’t accept His commandments. “On Earth as it is in Heaven,” if you don’t believe in His creation. “Give Us This Day,” if you don’t feel compassion for the poor. “Forgive Us Our Trespasses,” if you don’t forgive others. “Lead Us Not into Temptation,” if you don’t avoid occasion of sin. “Deliver Us from Evil,” if you don’t trust Him. “Amen,” if you don’t take seriously the words of the Our Father. Summorum Pontificum, the motu proprio granting greater freedom to celebrate the old Latin or Tridentine Mass, puts me in mind of the mercy of God, and how he comes to the aid of his suffering people. While not all of his people need or want the old Mass, there is a significant constituency for whom the lack of this familiar and time-honored form of worship has been a hardship, and Pope Benedict’s action is that of a genuine pastor. I am 50 and can barely remember the liturgy that started to drastically change when I was 8, in late 1964. I first discovered the old Mass by coming upon pictures of President Kennedy’s funeral Mass in an old issue of Life magazine. Later, I found a pre-Vatican II missal and was fascinated by the color photos of a young priest at various stages of celebrating a Mass. Despite growing up in the 1960s in an “updated” Church, I was eager to know more about the Latin Mass and longed for it despite never having really known it. By the time I was in college, this was largely behind me as I concluded that the door had been closed on the traditional form of Mass. This was reversed in a meaningful way some 20 years ago as Pope John Paul II allowed for limited use of the Tridentine Mass. I found that my original attraction had been warranted, and that my occasional assistance at the old Mass is a great aid to prayer and faith at every level. I am not alone — and most of the people attracted to the Latin Mass that I know are younger than me. A now-elderly former colleague called me just this week to tell me how Sunday Latin Mass and daily Rosary are now sustaining her and her husband as he faces cancer treatment. They had been away from the sacraments for decades. It was not as easy for a childhood neighbor of mine, a gentle and charitable woman who spoke lovingly of the Mass of her youth but who no longer went to church. Over time, it became clear to me that she was put off by the changes. She was too estranged (and too frail of health) to ever come back. Based on what I have read and seen for myself, many fallen-away Catholics were disaffected by the drastic change in our liturgy — some without fully grasping that this was such a significant factor. Others avoided naming the reason so as not to appear out of step. The editor of a glossy trade publication, a man of 57 and a connoisseur of modern music, recently told me that, as a high school student, he simply lost his faith at the sight of Mass in English accompanied by folk guitar. Many, like the poet Tito Casini, novelist Agatha Christie, and a host of other artists and intellectuals, were of an elevated sensibility, deeply appreciative of the beauty that all readily ascribe to the old Mass, and did not hesitate to identify the nature of their difficulties. Through it all, God’s ways are not our ways. He tests us — and cares for us — in a variety of ways. I like to think that Pope Paul VI and his collaborators were doing the old Mass a great favor by insisting on a full switch to the new Mass. It was in those years, the late 1960s, when the western world experienced profound tumult — a true cultural hurricane. When a hurricane is bearing down, you wrap your old treasures up and find a safe place for them, usually the attic, and you leave them hidden until the storms have certainly passed. English Jesuit Father Hugh Thwaites is especially fond of this analogy because much of the blame for the collapse that Catholicism experienced in many places in those years would have fallen disproportionately on the Latin Mass — had it been around to take the hit. The Mass we now say at St. John’s whether in English or Latin came after the Council. The Council ended in 1965, the new order of the Mass came in 1970. The Church, since the days of Pope St. Pius X, has encouraged actual participation at the Mass. The 1962 missal contains changes that foster that participation, so the charge of the congregation being dumb spectators is not true. Why was the Motu Propio issued? Pope Benedict, as a Cardinal, wrote extensively on the liturgy and frequently mentioned the suppression of the older form of the Mass by Pope Paul VI when promulgating the new reformed missal of 1970 (the Mass we now celebrate either in English or Latin) after an intervening period of a temporary missal (1965). He believed and continues to believe that something so ancient (going back 1500 years) and sacred could be forbidden and those who were attached to that form considered, as one author put it, like “the nutty old aunt in the attic”. The Pope does not question the holiness of the new missal, but he says that the way in which it came about was alien to the Church’s traditions. Many who were enthusiastic about a renewal of the Mass during the years of the Council felt betrayed by the reformed missal of 1970. They claim (as does the Pope) that this was not what the Council had envisioned. Is the Holy Father leading us backwards? Most people would say no, but I would say yes – in order to lead us forward. He wants to bring the church into contact with that form of the Mass which was the only western liturgy (outside the rite of Milan) that was celebrated during the Second Vatican Council. There was a rupture after Council in the liturgy, the Holy Father wants to go back to heal that break so that the liturgy may continue as a living continuum. That is why he says we need internal reconciliation. The Church has been suffering these past 40 years because of the unintended rupture. The Church must reconcile herself with her own tradition, for that is who she is, it is her own identity. The missal of Paul VI will benefit from the infusion of sap from the 62 missal and after a reform of the reform be even more resplendent and effective. 1. the noon Mass, which is now said in Latin according to the missal of Pope Paul VI (1970 – Novus Ordo) will become a Solemn High Mass or High Mass celebrated according to the missal of Blessed John XXIIII (the most ancient rite”). This will occur sometime in early October. 2. I will allow the celebration of all sacraments except Confirmation according to the rite of 1962 if a person requests them. This will also take effect in October. 3. I will allow occasional Masses (wedding anniversaries, etc.) in the 1962 rite for those who request it. 4. I will allow weddings and funerals in the 62 rite for those who request it. 5. 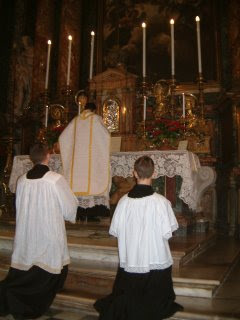 I will establish one Mass on a holy day according to the 62 missal; there will still be 4 Masses in the present rite. 6. I will consider another additional Mass on First Fridays after consulting with the pastoral council. The date given by the Pope for this decree to become law, i.e., go into effect is September 14 of this year. We await further guidance from the bishops on these matters. We also need to buy items unique to those types of Masses; financial donations towards this would be appreciated. The V2 Popes said WHAT? “I wouldn’t know what to say,” the girl replied. “Just say what you hear Mommy say,” her mother answered.